LAUREL, MARYLAND—NASA’s New Horizons probe has racked up a list of accomplishments since its launch in 2006, traveling billions of kilometers and, in 2015, unveiling the atmosphere and surface of the dwarf planet Pluto during a rapid flyby. But in a few days, as Earth moves into a new year, New Horizons will attempt its trickiest feat of all: traveling back in time. Until the early 1990s, scientists did not have evidence that this band of rocky bodies existed; it had only been theorized by researchers, including its namesake Gerard Kuiper. Since then, astronomers have discovered thousands of Kuiper belt objects past Neptune, with many more likely still unseen. Researchers have also discovered that this menagerie has a complicated structure, reflecting the solar system’s turbulent history. “I call it the solar system’s attic,” Stern says. Some of the belt’s objects, including Pluto, likely formed closer to the sun and were flung outward by gyrations of the giant planets. But others, like the relatively tiny MU69, likely formed where they are today, in languid circular orbits some 45 times farther than Earth is from the sun. Visiting what astronomers refer to as a “cold classical” was part of New Horizons’s $800 million mission from the start. But finding one to visit proved trickier than expected. After its Pluto encounter, New Horizons is exiting the solar system by flying straight toward the center of the Milky Way, into a kaleidoscope of stars, making the discovery of a dark small object it could visit a challenge. 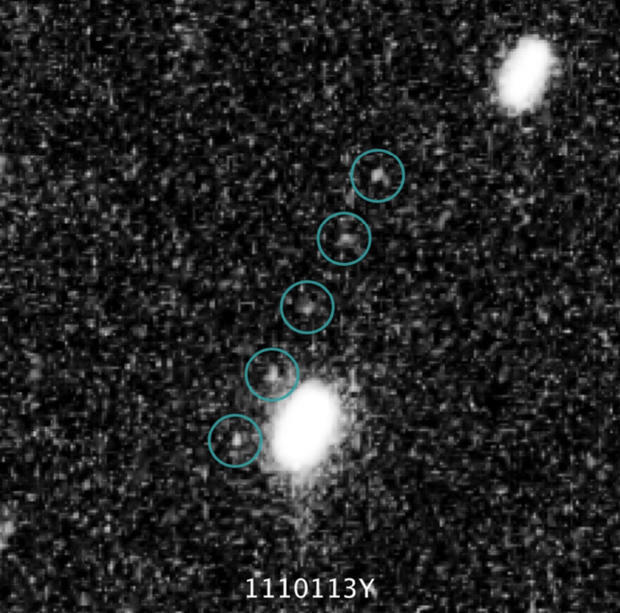 Finally, the Hubble Telescope was able to locate five suitable candidates, with the New Horizons team choosing MU69 because they could reach it quickest and with the least fuel consumption, leaving future exploration options within the belt open—and not, they swear, for the holiday-themed arrival time. Indeed, the timing may turn out to be less than opportune for publicity given that NASA’s vaunted media operations, including its popular video channel, will likely remain dark during the encounter because of the U.S. government shutdown. The flyby will be familiar to anyone who followed the spacecraft’s Pluto campaign. But now the spacecraft is older, its nuclear power source is waning, and it’s much farther away. The team is smaller and had less time to prepare, says Alice Bowman, the mission operation manager for New Horizons. 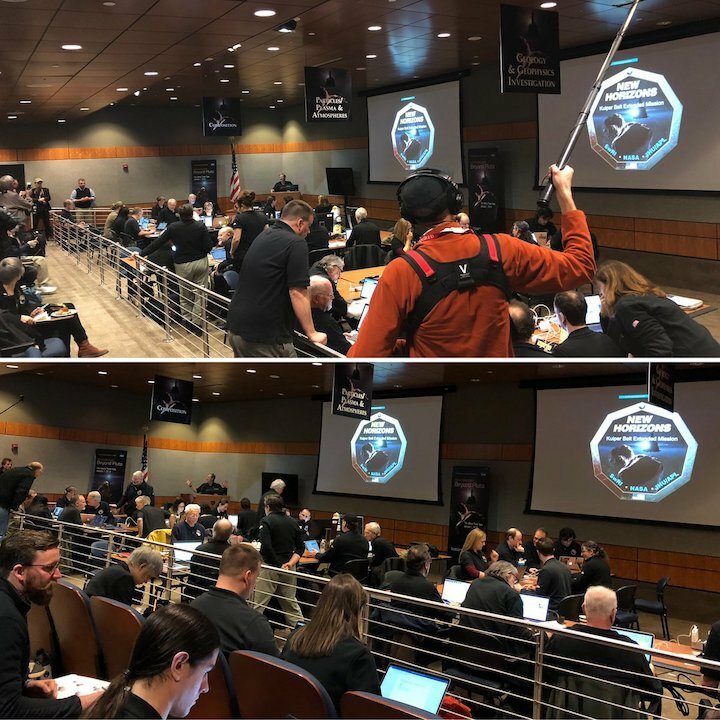 “It’s a much quicker, much harder mission.” It now takes a signal from mission control at APL 6 hours to reach the spacecraft, requiring everything about the flyby to be even more carefully scripted than for Pluto. Earlier this month, New Horizons’s Telescope—essentially a camera with a telephoto lens—spent several weeks scouring the region around MU69, hunting for hazards, such as rings or moons. None seen, its science team opted for the closest approach, passing only 3500 kilometers away from its surface. The flyby technically began on Christmas. Unlike Pluto, whose orbit has been precisely charted for a long time, MU69 was only discovered 4 years ago and its trajectory is not perfectly known. Because of this, the team has to rely on direct observation of the body, which for now still appears as little more than a pixel in its telescope, to understand its location relative to New Horizons. Until this weekend, the team is using the probe’s telescope to get a handle on the uncertainty of MU69’s location. Although it will be too late to tweak the spacecraft’s trajectory, the team will be able to rework the script of its high-resolution camera so that it can be certain of imaging MU69. This final update will then be relayed to New Horizons on 30 December. Even if the partial shutdown of the federal government, which includes NASA, continues into the new year, a festive atmosphere will reign at APL, which as a NASA contractor can continue its work, covering expenses from its own reserves. New Horizons will fly past MU69 at 12:33 a.m. Eastern Standard Time, shooting past at 14 kilometers per second, and it will take some 8 hours for the spacecraft’s first data to reach back to Earth, indicating its survival, along with a clutch of initial observations— The New York Times package, as Stern calls it. The first low-resolution image likely won’t come until late on New Year’s Day, with better imagery the day after. Don’t wait up. Little is known about what New Horizons will see. “We don’t even have a betting pool going,” Stern says. Telescopes trained on MU69, from Hubble to ground-based facilities, have revealed that, like other cold classicals, it has a dark, reddish hue, along with what looks an oblong shape, possibly indicating a small binary object. That wouldn’t be unheard of—scientists believe a third of the objects in the Kuiper belt could be such binaries, a reflection of the calm conditions in which they formed. These observations have also been unable to tease out variations in the sunlight reflected off of MU69, which could normally be used to tease out its rotation. This could be thanks to an unusually fast or slow rotation; microscopic dust; MU69’s axis pointing directly toward Earth; or a small swarm of miniature moons. Something as simple as counting the number of craters on its surface could hold vital clues, says Brett Gladman, an astronomer at the University of British Columbia in Vancouver, Canada. 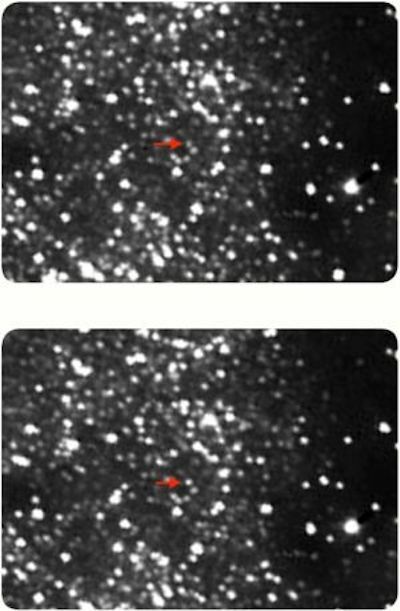 For example, Pluto and its moon had far fewer craters than expected, and there were fewer, smaller ones than expected. If MU69 shows a similar pattern, given the Kuiper belt’s primordial nature, Gladman says, “that means learning something directly about the sizes of the objects that the solar system originally formed out of.” Similarly, the craters could also inform just how much the migrations of the giant planets to their current orbits tossed the solar system around. Although the MU69 flyby will garner the headlines, it remains an N of 1 representing a large population. 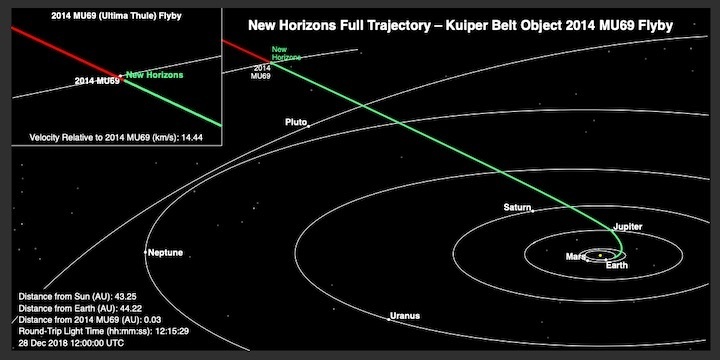 So New Horizons, before and after the flyby, has turned itself into a remote observatory, using its telescope to examine two dozen similar Kuiper belt objects. These observations benefit from their angle. Telescopes on Earth, and around it, can only see the Kuiper belt with the sun beaming at it head-on. New Horizons can observe these bodies at a different angle and, much like how the bright green of a field of grass becomes mottled when its blades cast shadows on one another, that can reveal the texture and material of a surface. “It will tell us if Ultima is typical of its neighbors or if it’s some kind of oddball,” Spencer says. It gave earthlings our first close-up images of Pluto. Now, just three-and-a-half years later, NASA’s New Horizons spacecraft is closing in on a mysterious hunk of reddish rock and ice that’s inspired much fascination within the astronomy community. According to NASA, the hunk stretches about 20 miles (32 kilometers) across, and it’s significant to space scientists because it is potentially the most primitive object ever encountered by a spacecraft. Astronomers see this as an opportunity to check out something that scientists say could be as as old as the moments when the solar system’s planets were first forming. Ultima Thule is located in a region of space at the edge of the solar system called the Kuiper Belt. It’s mostly home to hundreds of thousands of asteroids and comet-like objects. The New Horizons spacecraft, which is about the size of a baby grand piano, is set to reach Ultima Thule on Jan. 1 at 12:30am EST. Images are expected to transmit 4 billion miles back to earth by 10am. The images of Ultima Thule are really just an encore performance from the New Horizons spacecraft, which was dispatched from Earth to snap images of Pluto. But scientists say the craft still has enough power to keep it traveling through space through the mid-2030s. So they intend to send it further into the Kuiper Belt, where it’ll give new close-up insights into regions of space we’ve never seen before. 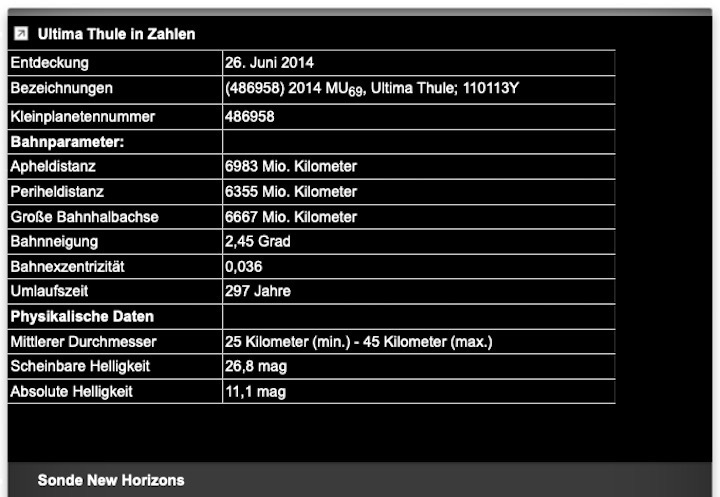 New Horizons #UltimaThule Flyby Events (All Times Eastern). New Horizons live events will air on NASA Television. For mission status updates follow @NASANewHorizons. Friday, Dec. 28, 1 p.m.: Briefing previews New Horizons flyby of the Kuiper Belt object Ultima Thule. 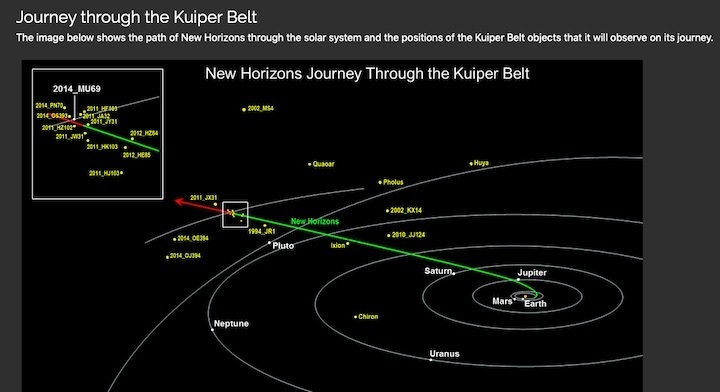 The New Horizons team used the Hubble Space Telescope to search for the next Kuiper Belt object to fly by after Pluto. 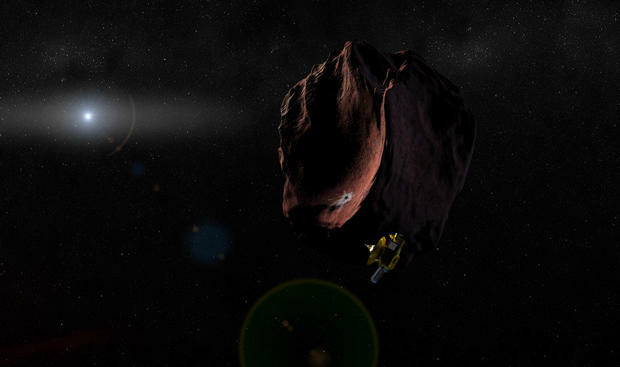 Using observations made with Hubble on June 26, 2014, the science team discovered an object that New Horizons could reach with its available fuel. The object was subsequently designated 2014 MU69, given the minor planet number 485968, and based on public votes, nicknamed "Ultima Thule", which means "beyond the known world". Ultima Thule is located in the Kuiper belt in the outermost regions of the Solar System, beyond the orbit of Neptune. 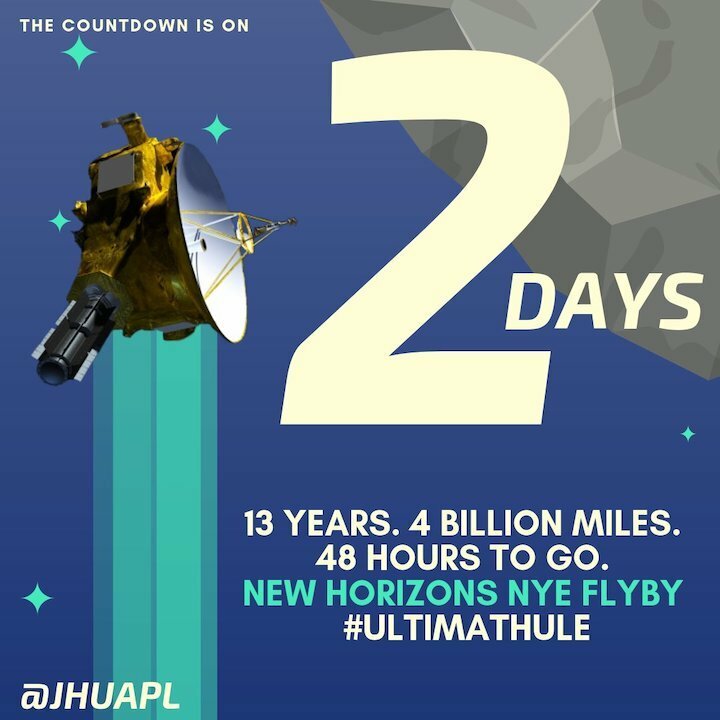 In the early morning of January 1st 2019 Eastern Time, NASA's New Horizons spacecraft will fly by Ultima Thule at a distance of 3500 km (2200 miles). At this time, Ultima Thule will be at a distance of almost 6.5 billion km (4 billion miles) from the Sun, making this the most distant planetary flyby that has yet been attempted, and the first time that a Solar System object of this type has been seen close-up. Ultima Thule measures approximately 30 km in diameter, and is irregularly shaped. In July 2017, Ultima Thule passed in front of a star as seen from Earth (a stellar occultation), allowing astronomers to determine that its shape is most likely a contact binary (two bodies that are touching) or a close binary system (two objects that are orbiting each other). An artist's impression of Ultima Thule as a contact binary is shown in the accompanying picture. We will only know what Ultima Thule's surface looks like once New Horizons has sent back the first pictures after it has flown by, although based on observations of similar-sized Solar System objects, it will almost certainly display impact craters. The lighting environment at its surface is very dim, as it receives only about 0.05% of the light from the Sun that Earth does. We do know that Ultima Thule has a reddish color, probably caused by exposure of hydrocarbons to sunlight over billions of years. The flyby will also reveal whether it has any moons, or even a ring system. 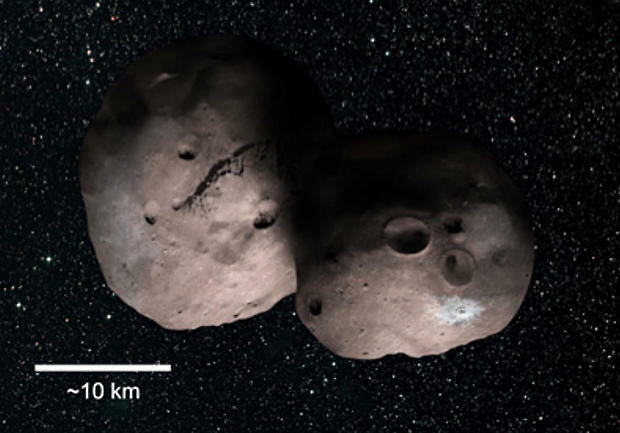 Ultima Thule belongs to a class of Kuiper belt objects called the "cold classicals", which have nearly circular orbits with low inclinations to the solar plane, and which have not been perturbed since their formation perhaps 4.6 billion years ago. Ultima Thule will therefore be the most primitive planetary object yet explored, and will reveal to us what conditions were like in this distant part of the Solar System as it condensed from the solar nebula. 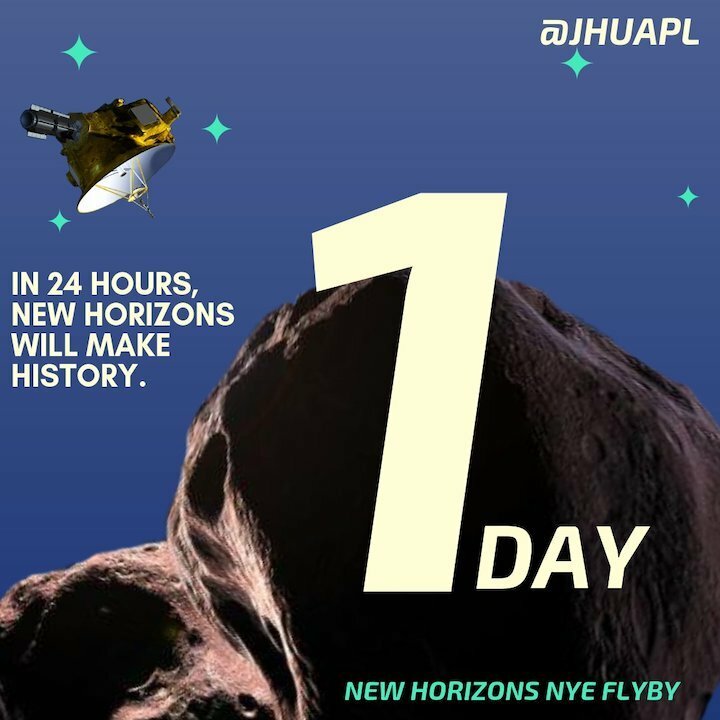 Three years and a billion miles past Pluto, NASA's New Horizons probe is on the verge of at least one more pioneering, once-in-a-lifetime milestone: a New Year's Day flyby of a small body known as 2014 MU69, unofficially dubbed Ultima Thule -- "beyond the known world" -- in a NASA naming contest. Like Pluto, Ultima Thule is a denizen of the remote Kuiper Belt, a vast realm beyond the orbit of Neptune populated by uncounted dwarf planets and a reservoir of frozen remnants left over from the birth of the solar system 4.6 billion years ago. Little more than a dim point of light to even the Hubble Space Telescope, Ultima Thule will be the most distant object ever directly explored, a record that likely will stand for decades to come if not longer. 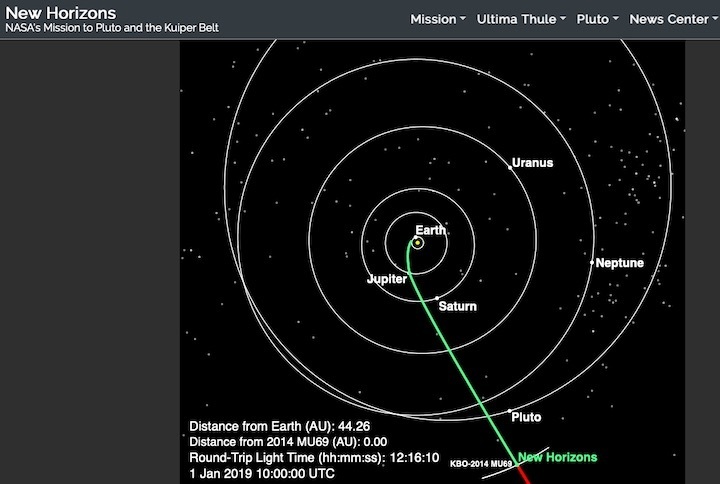 If all goes well, New Horizons will race by its target at a velocity of 32,000 mph -- nearly nine miles per second -- at 12:33 a.m. on New Year's Day, passing within about 2,200 miles of Ultima Thule's as-yet-unseen surface. Four hours later, the spacecraft will turn to aim its dish antenna at Earth to confirm a successful encounter. A few hours after that, the first high-priority images and other data will begin making their way back to the inner solar system. 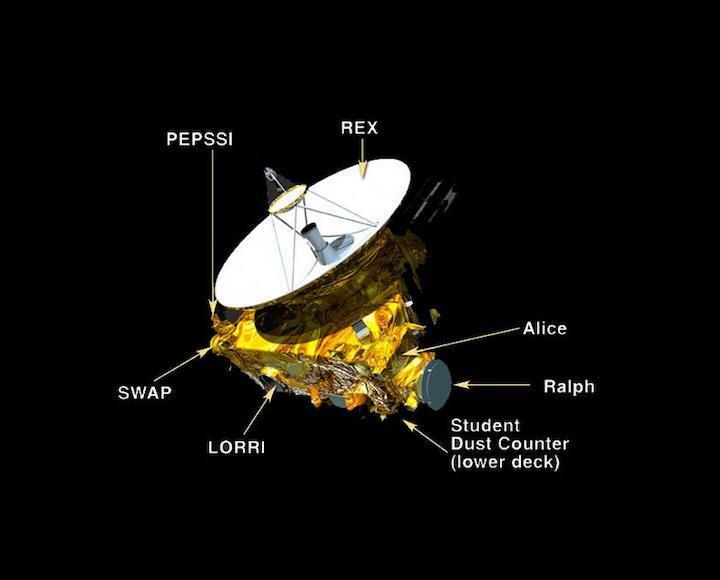 "Across the whole team, people are ready, they're in the game, we can't wait to go exploring," Alan Stern, the New Horizons principal investigator, said Friday. "It's been three-and-a-half years (since the Pluto flyby), we've worked so hard, people are ready to see that payoff and see what we can learn about the birth of our solar system." At Ultima Thule's distance of 4.1 billion miles from Earth, it will take radio signals, traveling 186,000 miles per second, six hours seven minutes and 58 seconds to cross the gulf to waiting scientists at Johns Hopkins University's Applied Physics Laboratory near Baltimore. 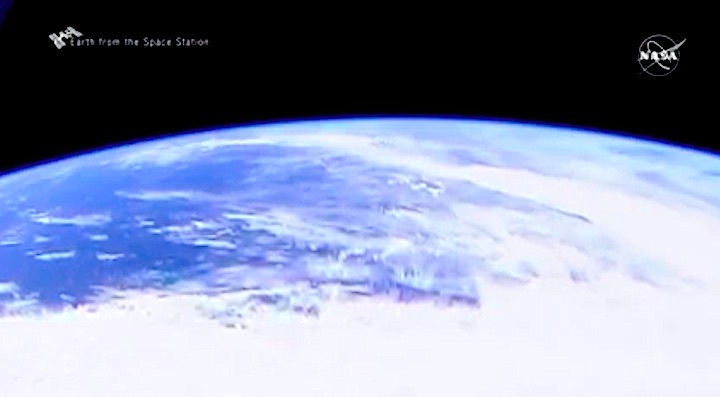 The first high-resolution image is expected to be unveiled during a Jan. 2 news briefing. Despite the ongoing government shutdown, the public is expected to be able to follow along on NASA's satellite television channel. But just in case, the Applied Physics Laboratory, which built and operates New Horizons for NASA, plans to post images and other data on the New Horizons web page and the lab's YouTube channel. Only a handful of images and other high-priority data are expected before New Horizons moves behind the sun as viewed from Earth on Jan. 4, temporarily interrupting communications. But even when the downlink resumes, it will take about 20 months to bring in the entire treasure trove to Earth. 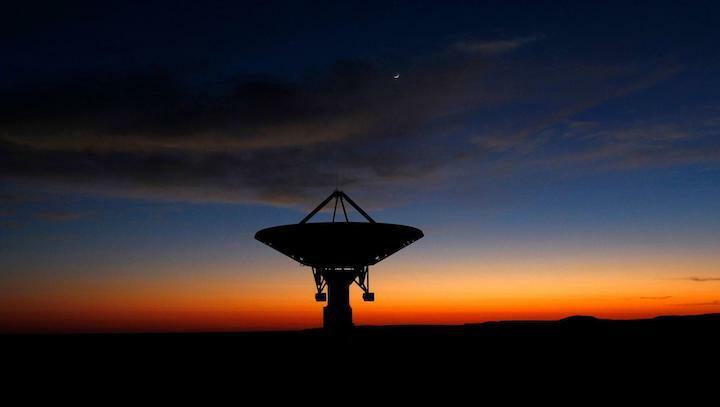 That's because of the enormous distances involved, the faint signal from New Horizons' 30-watt transmitter and other demands on NASA's globe-spanning Deep Space Network antennas used to communicate with spacecraft across the solar system. For scientists eager to study an untouched remnant of the original cloud of rocky debris that coalesced to form the solar system, the long wait will be worth it. "Everything that we have visited before has been warmed up at some point," Stern said in an interview earlier this month. "Asteroids orbit close to the sun, the comets ... were born cold, but we only have visited comets when they're down near the Earth's orbit, when they're warm. The heat, the warmth causes chemical reactions to take place, it can drive surface processes, etc., that create an evolution." Ultima Thule, he said, "is completely unmarked by any of those things." It is classified as a "cold classical," that is, a Kuiper Belt body with a nearly circular orbit that is only slightly tilted to the plane of the solar system's planets. Another major population of Kuiper Belt bodies, made up of material that originated closer to the Sun, was pushed outward by gravitational interactions in the distant past. But not the cold classicals and Ultima Thule. "It was born four billion miles from the sun, it has always been there, it's temperature is just barely above absolute zero," Stern said. "I don't believe there's any object we've ever visited that's been kept that cold its entire existence. So this is really a time capsule, that's the scientific value." New Horizons will fly more than two times closer to Ultima Thule than it did during the Pluto flyby, Stern said, "so the images are going to be much more detailed." "We're going to find out how this thing is built, how much it's evolved, what it's made of, if it has an atmosphere, if it has moons, if it has rings, we're going to take its temperature, we're going to measure its radar reflectivity, we're going to find out if it's surrounded by a dust cloud left over from formation," he said. "All that stuff and more, because we're not just going to take imagery," he added. "We map its surface, we map it in color and in addition to that, we map it in stereo so we have topography everywhere. We'll not just determine its composition, but we map it from place to place to see if it's the same everywhere or if it's made up of smaller building blocks." The encounter has five major objectives: to characterize the geology, morphology and topology of Ultima Thule; to map its surface color and composition; to determine its structure; to search for satellites and rings; and to look for any sort of a coma, or atmosphere. 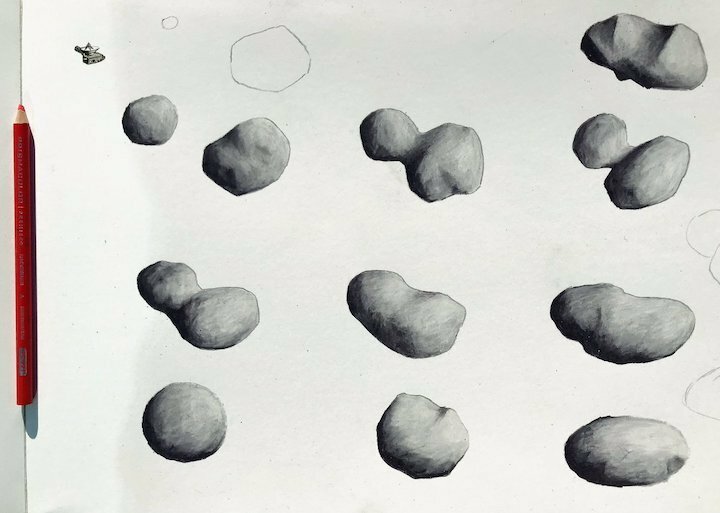 "Ultima Thule could be heavily cratered, highly pitted or it could even be smooth from ancient flows and ancient activity," said Carey Lisse, a New Horizons science team collaborator. "We don't know. We simply aren't going to know until we get there in January. I'm waiting to be surprised." Launched nearly 13 years ago in January 2006, New Horizons flew past Jupiter in February 2007, using the giant planet as a target to test its instruments and, more important, using its gravity to fling the craft onto a fast-track trajectory to Pluto. Even so, moving 100 times faster than a jetliner throughout its voyage, it still took another eight long years to reach its target in July 2015, flying past at a distance of 7,800 miles to collect the first close-up pictures and a wealth of data about the solar system's most famous dwarf planet. While the Pluto encounter was the spacecraft's primary goal, mission managers knew it would have left over propellant and that its nuclear power supply would keep the probe functioning through the 2020s. Well before the Pluto flyby, the team requested observing time on the Hubble Space Telescope to look for possible targets of opportunity past Pluto that might be close enough to New Horizons' trajectory to enable another flyby. Hubble discovered Ultima Thule in images captured on June 26, 2014. It was catalogued as 2014 MU69 and given the minor planet number 485968. 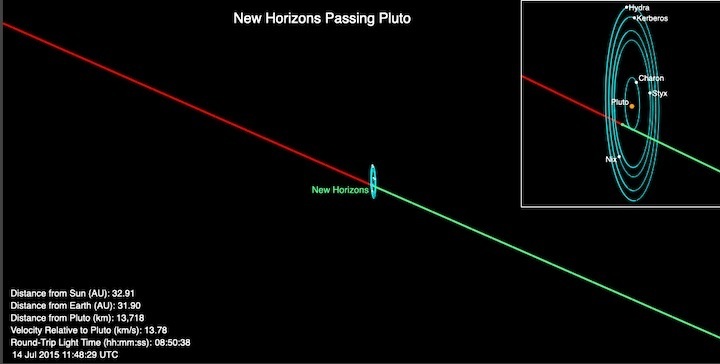 An analysis of its orbit showed New Horizons could reach it with a post-Pluto trajectory correction maneuver. After the Pluto encounter was complete, NASA managers approved a mission extension. A carefully planned rocket firing was carried out, adjusting New Horizons' course to set up the upcoming encounter with Ultima Thule. New Horizons did not spot its quarry until Aug. 15 this year, at a distance of more than 100 million miles. It was a barely visible pinpoint of light, and will remain little more than a brighter point of light until Monday, the day before the flyby. Even so, scientists have at least some idea what to expect when New Horizons gets there. Based on occultation observations in which Ultima Thule passed in front of a background star as viewed from Earth, researchers believe the target is an elongated body measuring about 17 miles across. It may be made up of two bodies in close orbit or two lobes that are physically connected, a so-called "contact binary." Researchers know Ultima Thule receives only about 0.05 percent of the sunlight Earth does and they know it is reddish in color. But they don't yet know its exact dimensions, whether it has any rings, moons or any trace of an atmosphere. "Really, we have no idea what to expect," Stern told planetary scientists during a conference in October. "We only discovered it in 2014 with the Hubble Space Telescope working at the very limit of its fantastic capabilities. We've been able to learn enough about its orbit to be able to intercept it and target it. But there's very little else we know." Whatever they find out, it will happen very, very quickly. Ultima Thule's small size means New Horizons' cameras will not begin to resolve it until the day before the encounter. On Sunday, for example, the best photos will have a resolution of about 6.2 miles per picture element, or pixel, and Ultima Thule will measure two to three pixels across. On New Year's Eve, the resolution will improve to 3.4 miles per pixel and the body will measure five to six pixels across. But by the evening of New Year's Day, the resolution will have improved to 1,000 feet per pixel and the day after that, 500 feet per pixel with Ultima Thule stretching across 215 pixels. "Although we're traveling at about the same speed as we pass Ultima that we passed Pluto, Pluto's about the size of a continent like North America," Stern said. "And so, when we were 10 weeks out from Pluto we could already resolve its disk about as well as the Hubble Space Telescope, and each week we could see more and more detail. "But Ultima 10 weeks out is just a dot in the distance. And it will remain as a dot in the distance until literally the day before the flyby when we start to resolve it. By the day after the flyby, we'll have high resolution images, we hope even higher resolution than the best images of Pluto. So it's going to be quick." New Horizons is equipped with six primary instruments: an imaging spectrometer known as Alice, a multi-spectral visible light camera called Ralph, a long-range reconnaissance imager -- LORRI -- incorporating an 8-inch telescope, a solar wind particle detector, an energetic particle spectrometer and a student-built dust counter. In addition, its radio system includes circuity enabling precise analysis of changes caused when signals from Earth pass through an atmosphere. Data is stored on redundant eight-gigabyte solid-state recorders and sent back to Earth with an X-band transmitter using an 83-inch-wide fixed dish antenna. Data transmission rates will be slightly better than 1,000 bits per second. Stern said the encounter poses a much tougher challenge for New Horizons than Pluto did. "This one is harder for a number of different reasons. First of all, it's smaller and it's fainter and so it's harder to track, it's harder to home in on," he said. "It's 100 times smaller, it's 10,000 times fainter. Secondly, every year, the on board nuclear power supply produces less power. So now we have to much more carefully manage which instruments and avionics are on, we have to manage our power much more carefully." Thirteen years after launch, the spacecraft's single radioisotope thermoelectric generator, or RTG, is producing only about 190 watts of power, roughly enough to energize three standard light bulbs. In addition, because the science team does not know what to expect, New Horizons is going to carefully search the area around Ultima Thule, on the lookout for moons or other features, so "there are going to be a lot of images of blank sky simply because we're trying to blanket the whole area in the event we discover a moon late." Four days after the flyby, communications with New Horizons will be suspended as the spacecraft moves behind he Sun as viewed from Earth. The science team has prioritized data playback to ensure a high-resolution image of Ultima Thule reaches Earth before the blackout begins. 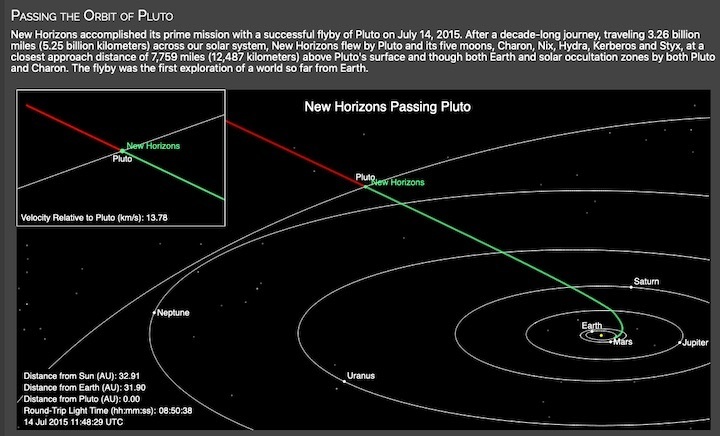 "This is a much faster reveal than anything we've done on New Horizons before," Stern said. "Essentially, it's an overnight conversion from a dot in the distance to a real world. And I think that first week in January, when we're getting the first detailed images back, is going to be breathtaking! Not just scientifically. I think for the people who follow the news just to see and think of what our race can do, what our species can do, is going to be amazing." Asked whether New Horizons can reach a third Kuiper Belt target down the road, Stern said he wants his team to stay focused on Ultima Thule in the near term. But after the encounter is complete, "we will look for another flyby target. I can't promise anyone, you or NASA, that we will find one (but) I can tell you this: there's nothing my team wants more than to get a second one." Closest flyby will come just after midnight in its operators' time zone. 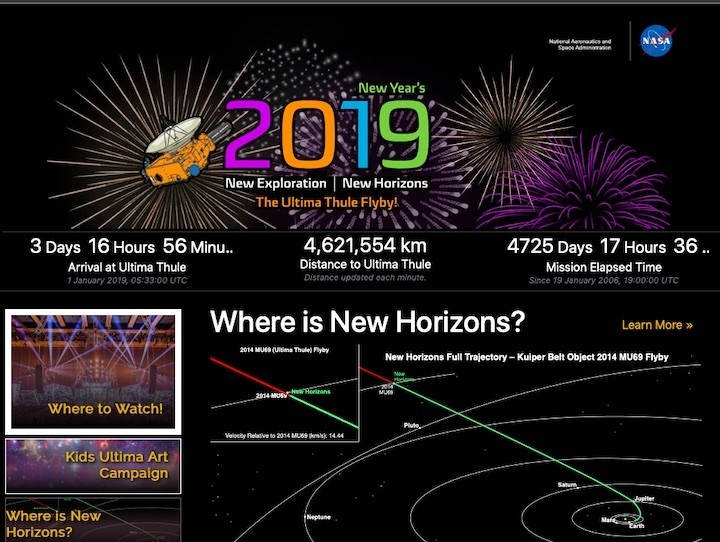 If you want your New Year celebrations to be truly out of this world, then you might consider stopping by the New Horizons website. Following on from its phenomenally successful flyby of Pluto, the spacecraft will perform its closest flyby of a small Kuiper Belt object at just after midnight in the US Eastern time zone—the one where the operations center of the Johns Hopkins University Applied Physics Laboratory is located. Indications that New Horizons survived the flyby—rather than running in to a small moon or ring—will have to wait for the roughly six hours it takes light to travel from the location of 2014 MU69, the target of its attentions. 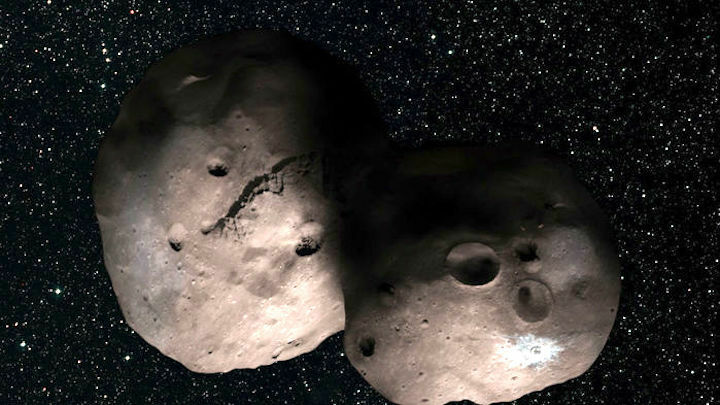 Nicknamed Ultima Thule, the object is a small ball of ice in the distant Kuiper Belt, which is a large collection of small bodies that froze out of a disk of gas and dust early in the Solar System's history. The full extent of our knowledge of Ultima Thule's surface is that it's about 30 kilometers across and not perfectly spherical, based on its occultation of a background star. It only reflects about 10 percent of the sunlight that reaches it, but imparts a reddish tint to what little light escapes. Beyond that, everything New Horizons sees will be a completely new discovery. NASA was still scanning Ultima for moons and rings in mid-December before committing to a flyby that will take New Horizons three times closer than it came to Pluto. We can make some inferences based on what we know about the Kuiper Belt, though. Ultima Thule's largely circular orbit means that it's almost certainly spent its entire existence over six billion kilometers from the Sun. At that distance, there wasn't as much of the material that formed the planets of the inner Solar System. Compensating for that somewhat is that the dim sunlight in the Kuiper Belt left it past the "snow line" for a variety of gasses, meaning those gasses froze out to form particles. The end result was a collection of small icy bodies, the vast majority smaller than Pluto. 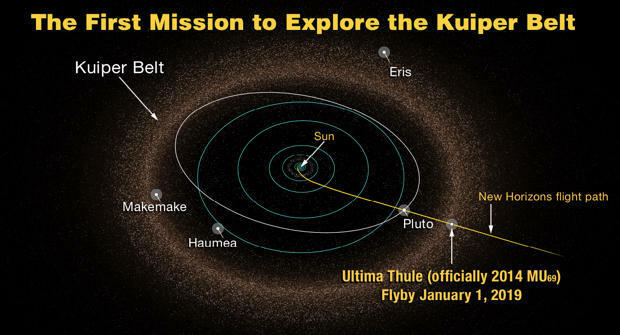 New Horizons' flyby of Ultima Thule is our first opportunity to see one of them up close, and will allow us to make inferences about the composition of other objects in the Kuiper Belt. The mission will create a number of additional firsts, as this will be the most distant flyby we've attempted. The Voyagers' cameras were shut down by the time they reached six billion miles from the Sun, meaning every photo New Horizons takes will be the most distant image we've ever captured. As mentioned, the 6.5 billion mile distance means that signals from New Horizons take about six hours to reach Earth. 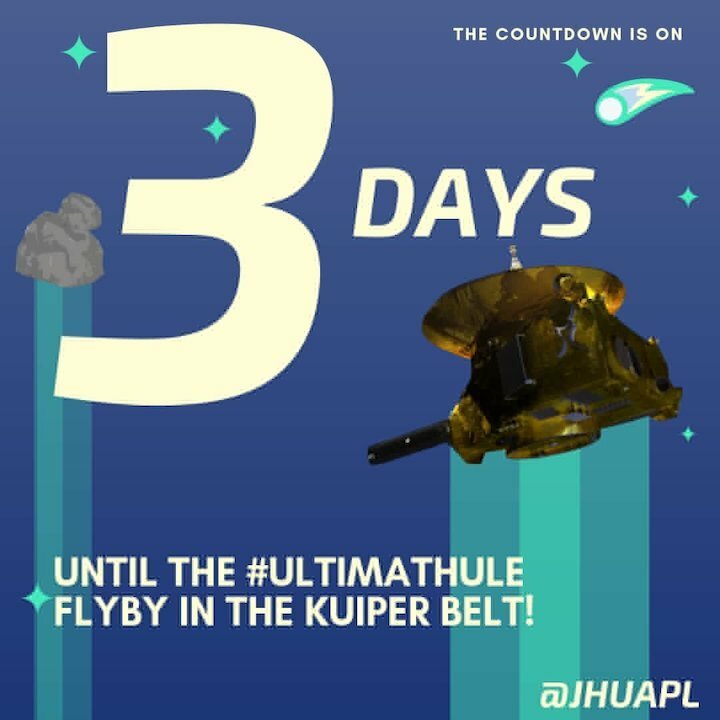 The spacecraft will also be pointing its instruments at Ultima Thule, rather than its primary transmitter at Earth, meaning that we'll have to wait for after the flyby to receive any high-resolution images of the object. If everything goes according to plan, we'll have plenty of New Year's presents awaiting us in 2019 as we get our first ever close look at a Kuiper Belt object. Three more days before @NASANewHorizons makes history! The flyby of #UltimaThule on #NYE2019 will be the first time an object so far will be explored by a #spacecraft. It's pretty far, about a billion miles from #Pluto! As of right now, we have no idea what #UltimaThule looks like. Occultations gave hints, Light curves are flat, and Ultima is smaller than 1 LORRI pixel. That will hopefully change tomorrow. 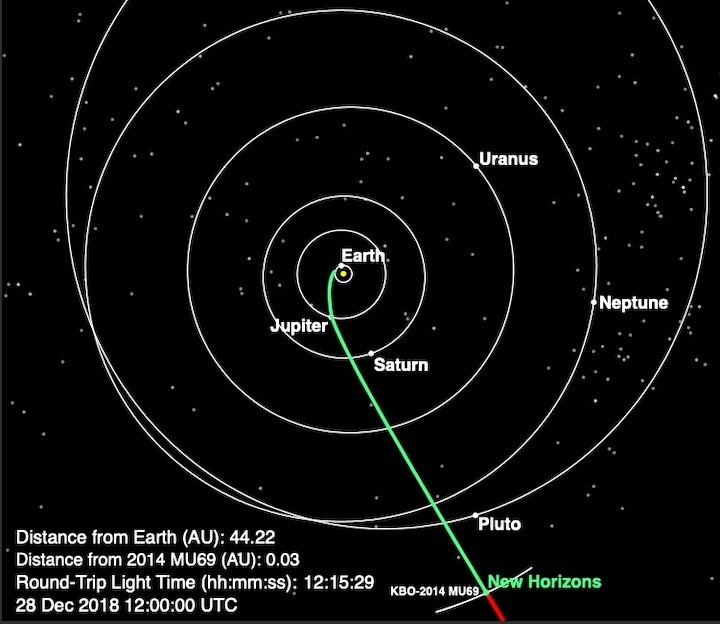 December 31, 2018From the Associate Administrator: Go New Horizons! In just a handful of hours, NASA's New Horizons spacecraft will perform the furthest encounter of an object in our solar system. On Jan. 1 at 12:33 a.m., New Horizons is set to fly by 2014 MU69, nicknamed Ultima Thule, and collect images and scientific data to beam back to Earth. Ultima orbits the Sun from a vast region of icy and rocky bodies beyond the orbit of Neptune. Studying this primitive world—which has been around, unaltered, since the beginning of the solar system—will provide us with vital insights into the origins and evolution of our celestial neighborhood. Below is a message from Thomas Zurbuchen, the associate administrator of NASA's Science Missions Directorate, to Alan Stern, New Horizons principal investigator of the Southwest Research Institute in Boulder, Colorado. Alan – as you know, we are on [government] shutdown, and I am unable to contribute to this historic event like I intended to. I will be sure to be there as a guest with my family! Here is why. 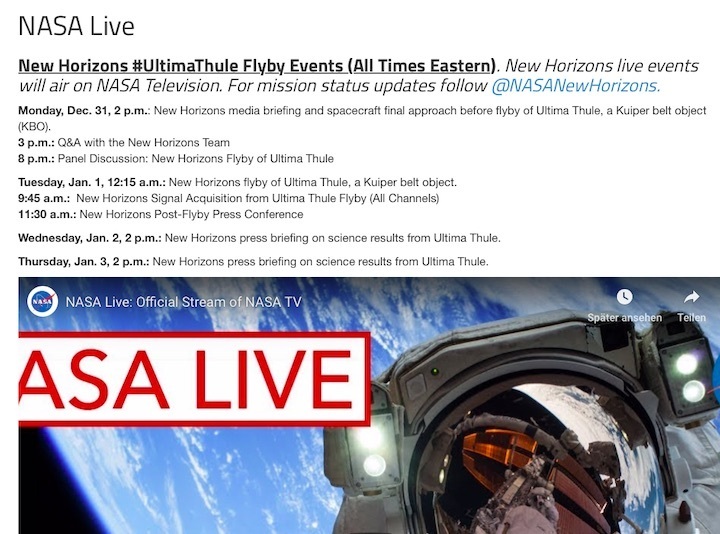 I think it is fitting that this Ultima Thule [flyby] is at the interface of the 60th anniversary of Explorer 1 in 2018 and the 50th of Apollo 11 in 2019. To me, this milestone of New Horizons is full of everything NASA and NASA Science is all about. It is about boundless aspiration and hope that are at the inception of exploration. It is about innovation and perseverance to actually create the success, by an amazing team that transcends what is reasonably expected or even what seems possible initially. And then, it is about surprise and transformative learning that has been at the heart of NASA and NASA Science and Exploration during the past 5-6 decades. The Ultima Thule flyby has all of these! For all of that, I wish you and the team the best of luck! We at NASA Science are incredibly proud of you and your team - both the science and engineering teams – and can't wait for the surprises that will be uncovered during the next hours and days. Go New Horizons! 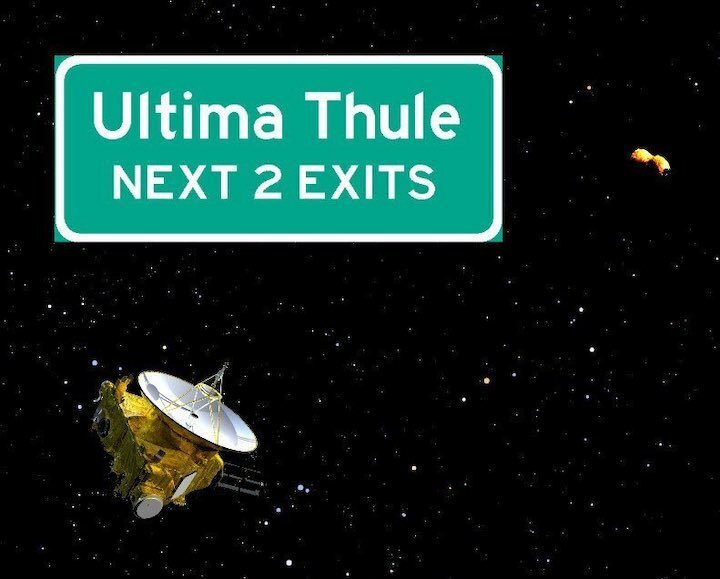 Go Ultima Thule!